This week's tribute goes to the current 1-2 punch in the Urban Division, the Drewyor brothers. Geoff and Brad, like all EFFL owners, have a rigorous schedule of checking injury lists, choosing starters, dealing with trade rumors, and staying updated on all the happenenings in the NFL during each week of practice in order to put the best possible team out on the field each and every week of the season. But they found time in the intense, time-consuming lifestyle that is an EFFL owner (just look at Bobby Ross - the most recent person to throw in the towel because he couldn't handle it, and the NFL isn't nearly as hard a life as the EFFL) to train for and run a MARATHON. If you are like me, you've never run more than 2 miles, and even that was hard. 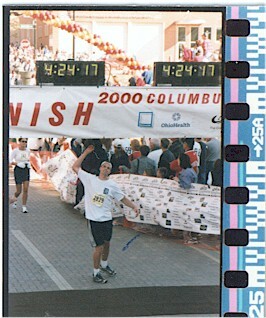 Here is a picture of Geoff finishing his 26 mile run in what appears to be Columbus, Ohio. Not pictured is Brad, who finished not far behind.